Sale of new house was final February 3rd. 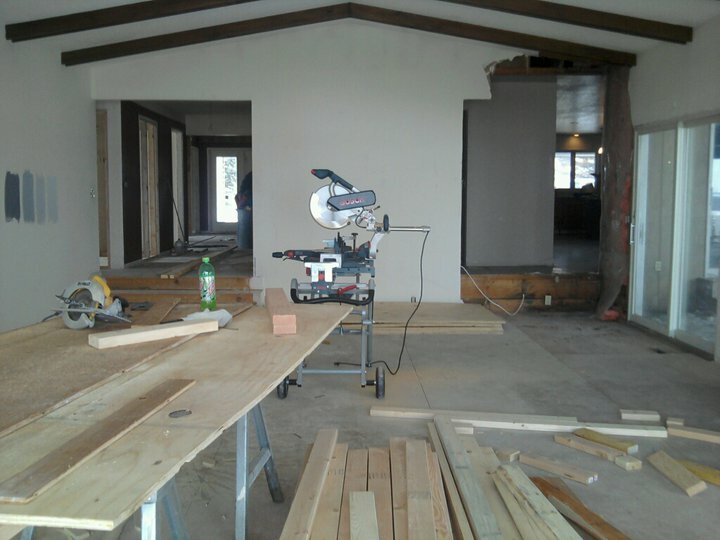 Prior to then we had the house cleared of all the junk and 1/2 of the demolition complete. We waited until the sale was final before we started re-arranging walls and doing anything else that cost major money. 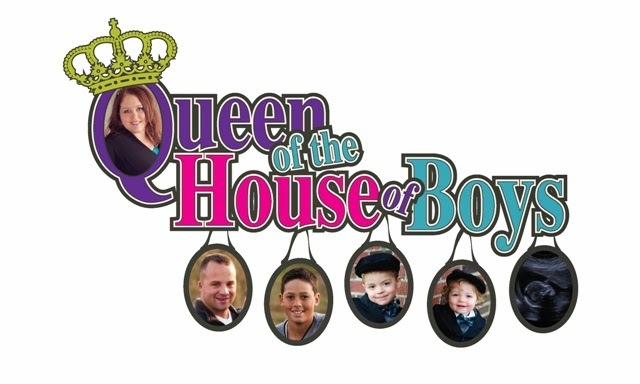 As of today we have the entire house remediated of all pet, smoke, & mold odors and debri. 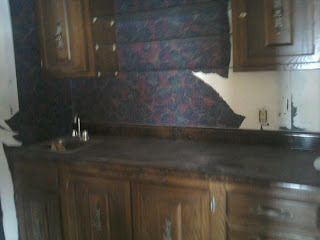 Literally every nook and cranny of this 3500 square foot home had to be cleaned to get the odors out. The deeper we dug..the more mold we found too. So glad we dug as deep as we did now. It would be horrible to put all the hard work in to run into mold problems later. 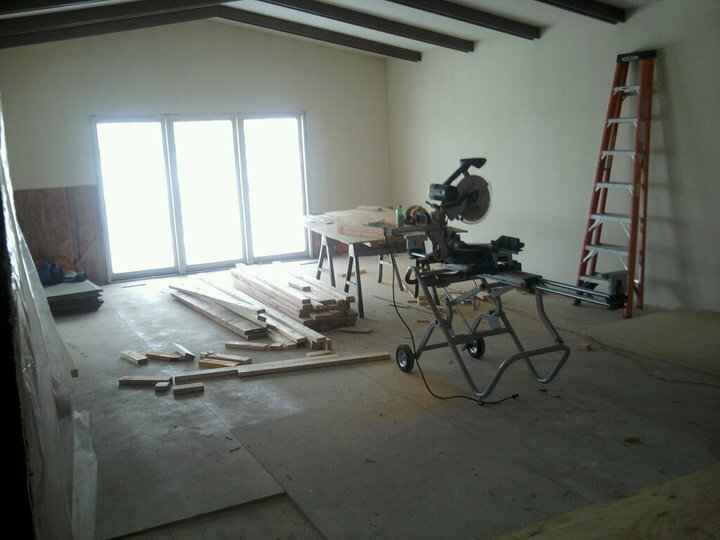 All 4 bathrooms were completely gutted down to the studs. I took some progress photos today. 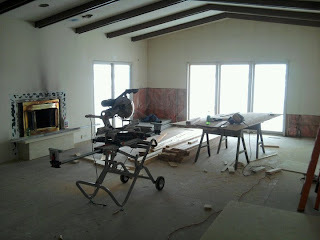 This is view from East side of Great room. We have added a second entry to the room. The entry on left was original, entry on right is new. 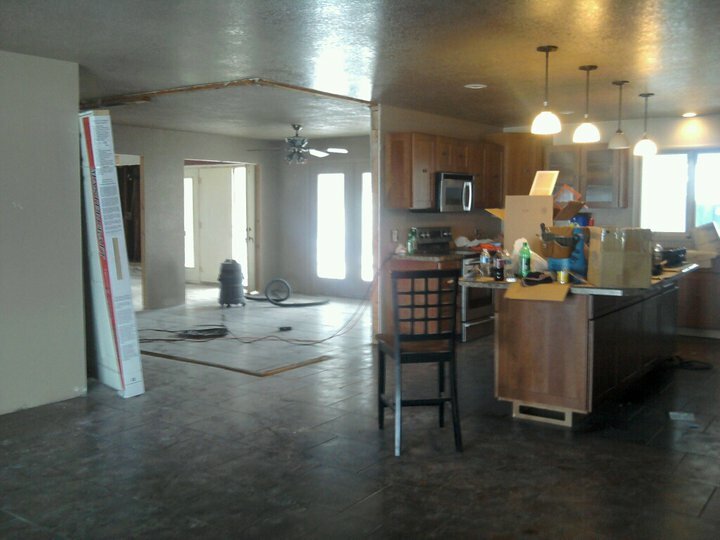 Opens up our view to the dining and kitchen area. It also allows more natural light to the coffee bar area and better air flow through house. View into great room from new entry. View into great room from original entry. The big decision I have to make this weekend is what kind of light fixtures I want to have installed into the ceiling. Currently only built in lighting in GR are 2 can lights above fireplace. 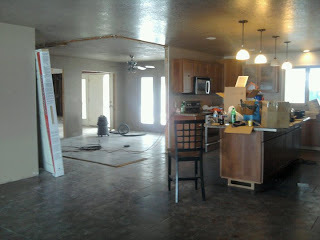 Need to decide if we want just 1 or 2 light fixtures hanging from peak, or 1 or 2 ceiling fan/lights hanging from peak. I don't know why this decision has been a hard one for me. This is the wet bar. Currently very dark. Due to budget we will keep existing cabinetry and counter here. Removing the wall paper will definitely be a huge improvement. 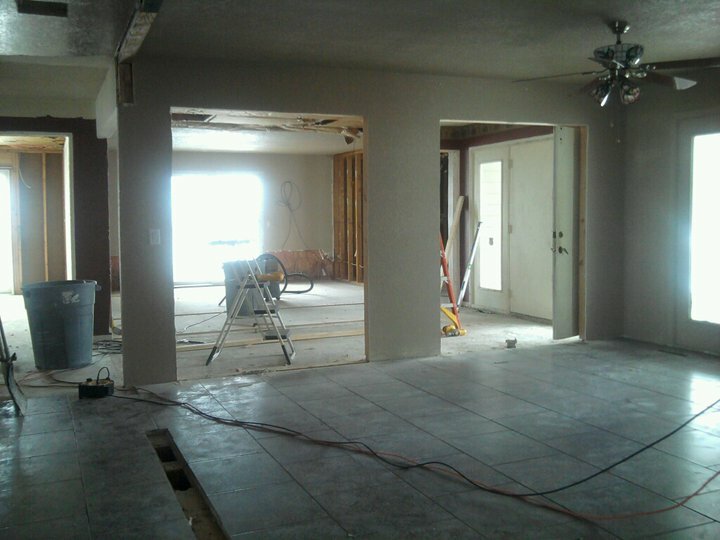 This is view into our entry foyer. I am standing in the kitchen taking a photo into the room. You can see the holes on the floor where there used to be a wall there. This room actually was a den or formal dining room. 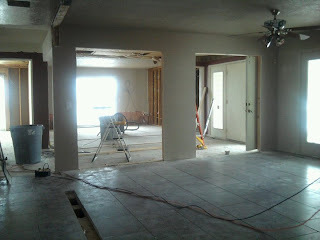 We are re-routing our front entry to be this room. We will then take the exising entry...which is on the other side of that wall and join that area in with our master bedroom and closet. The two holes we cut into the wall today are the 2 closets that will be accessible through the foyer room side. Then on the other side of them is the master closet. With the cutouts open now you can see where the original entry door is. Another view of the wall that was torn down in the previous den turned entry way. 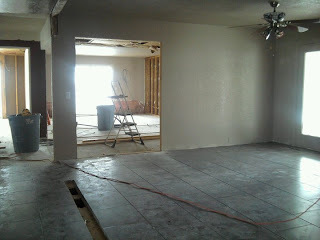 This really opened up the view into our kitchen & dining area. Our dining area is so large, there was no reason for a eat-in and a formal dining. Especially when we have the large island in the kitchen with the bar stools around it. Wow, you guys have gotten a lot done! I can't wait to see the progress!